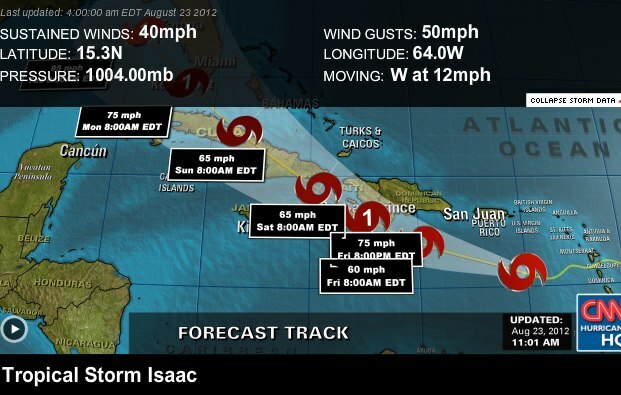 Saturday, August 25, 2012: For the last three days, we have been in communication with the team in Haiti to discuss hurricane Isaac’s potential landfall. The team had several trips planned between Port-au-Prince and Zorangé, as well as a trip scheduled to Gonaives. As of this morning, we heard from our national director, Inasson Mathurin, who told us that all is well, but there will be a temporary pause in traveling between Zorangé and Port-au-Prince. The rivers have flooded, making transportation between Zorangé and Bainet impossible. For those of you that have been to Haiti with HFHF, you may know Obed and Vierge. Last night they had to evacuate their home and took shelter at the trade school due to fierce wind in Zorangé. There was fear that their house may collapse. The good news: they are well! There is no damage to homes but plenty of damages to crops, which is usual. Once again, trips between Port-au-Prince and Bainet and Zorangé are being postponed for at least three days or until the rivers become passable again. Thanks to each and every one of our partners and supporters for your concern for Haiti this week! Wednesday, August 29, 2012: Five days after hurricane Isaac has made landfall in Haiti, some of the team in Zorangé decided to travel to Bainet to see how difficult or easy the trek would be. So Vierge, Wilner, Lucia, Ti Nana and a few others left Zorangé this morning around 8:00 a.m. and arrived in Bainet around 11:00 a.m.
Vierge told us that the water level was up to her chest (Vierge is almost six feet tall). The “roads” are not passable and Wilner wasn’t sure how soon vehicles will get to Zorangé. All four rivers flooded but the biggest river, the Bainet River, will take a little longer than the others to recede and we’re all hoping that within a few weeks all will return to normal. A lot of the team was traveling when Isaac arrived, thus they are scattered throughout Port au Prince and Bainet. They will try by this weekend to get back to Zorangé – most likely by walking the 11 miles from Bainet to Zorangé. Marcel is on his way today to Bainet from Port-au-Prince and he’s driving Tata there- so we will be speaking with him soon to learn how the road from Port-au-Prince to Bainet was.